Buried amongst the “Boulders of time” lies myriads of stories… ballads of rajas and their queens, tales of wit, bravery, and justice all waiting to be unveiled. Yes, Boulders yonder there stood a land that once flourished, where happiness reigned! Well, tempus fugit, it has churned itself into a major centre for holiday getaway. 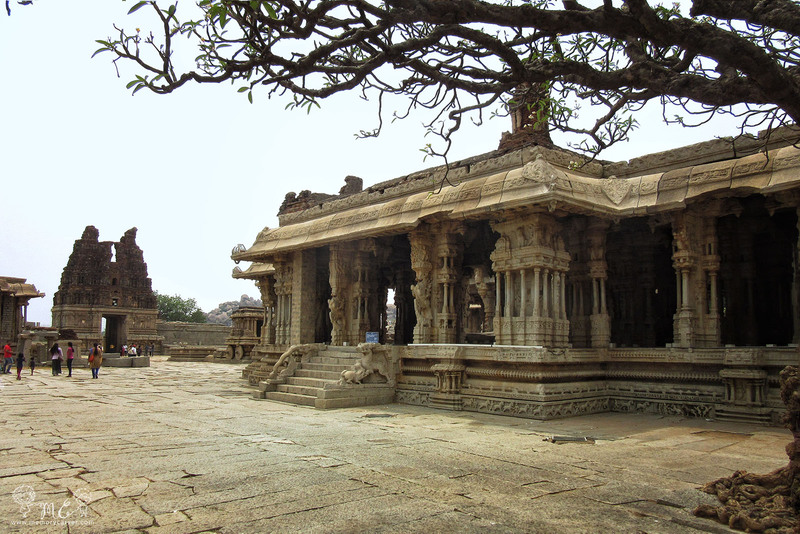 So, pack your bags this winter and travel back in time to the prosperous kingdom of Vijayanagara. Let me now take you through our visit to the Shangri-La of Vijayanagara Empire, Hampi, once a palmy kingdom of King Krishnadevaraya. 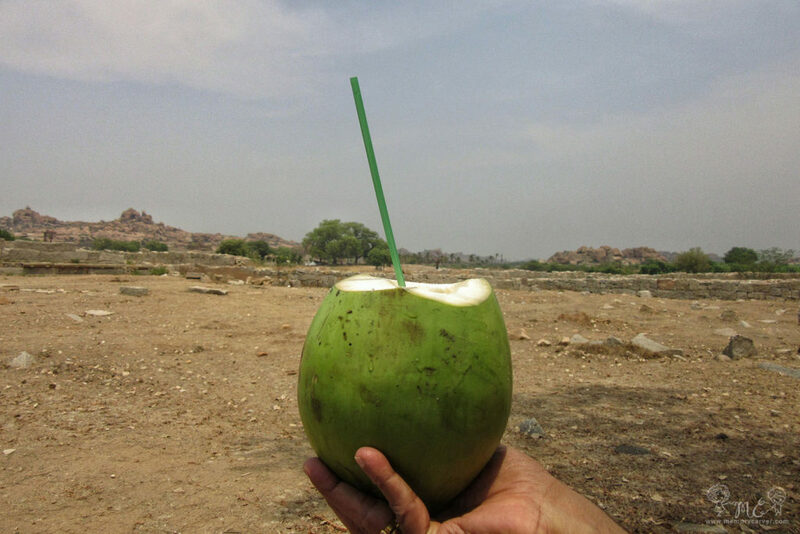 Hampi road trip: A 370 odd km ride and open your eyes to get gorgonized by the view. Disclaimer, the roads can get pretty bumpy towards the end! 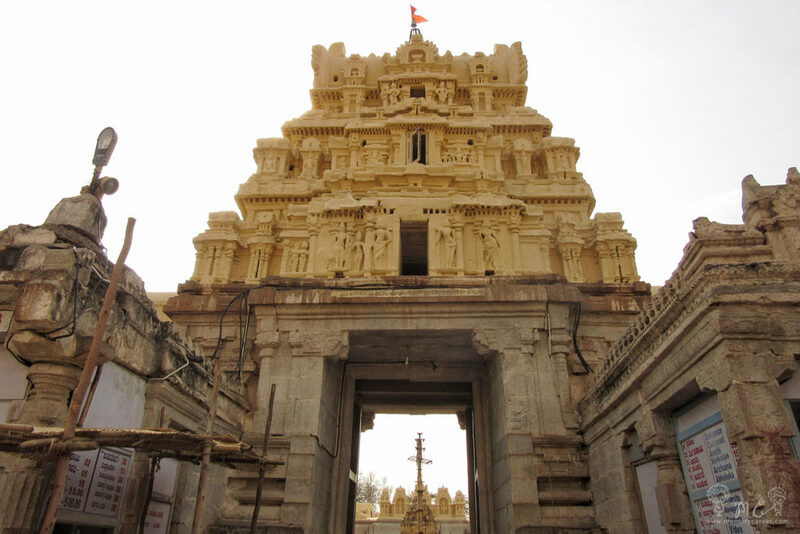 Nearest station to Hampi: Hosapete Junction (HPT) which is about 13km from Hampi is the closest you can get by train. You can opt to travel overnight from Bangalore, Hyderabad, or Chennai. Buses ply regularly from Hospet to Hampi. 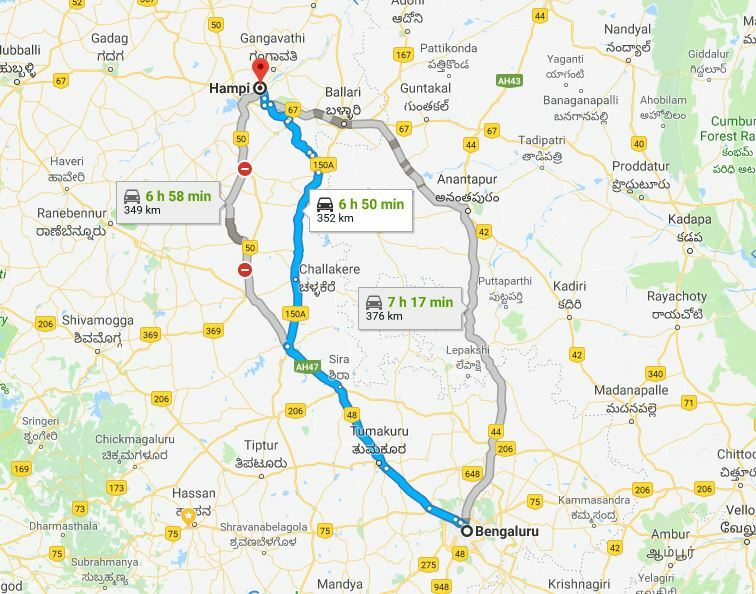 Nearest Airport to Hampi: Hubli airport, which is about 160 km from Hampi would be the nearest airport. Those up for a road trip can always workaround by taking a flight to Bangalore and renting a car from there. By road: My personal choice would always be to travel by road, a ride through the nature’s heart. The drive would round-out to 370km from Bangalore. Being a tourist destination you sure won’t run out of options to stay, be it luxury, budget, or camping. 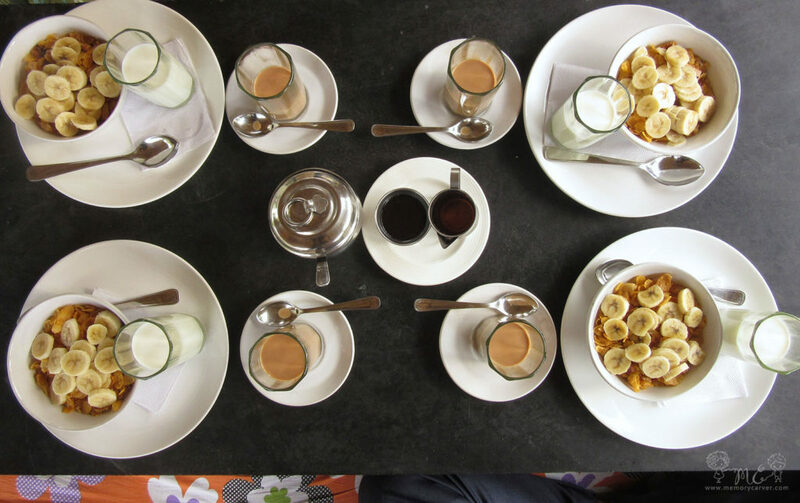 Get more information on where to dine and stay in Hampi here. 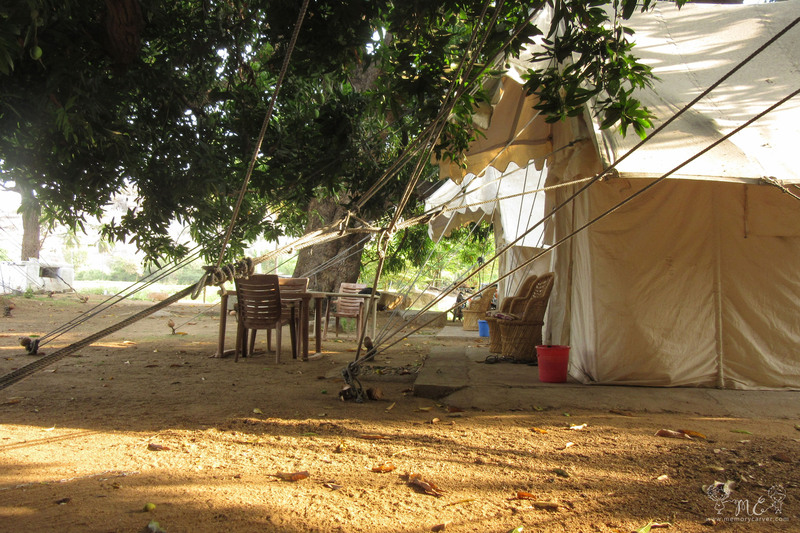 If you are a novice explorer who is not so well-versed at campcraft, Tutti Hampi tents and café is what I’d recommend. Experience the tent life with a tint of modernism to it. 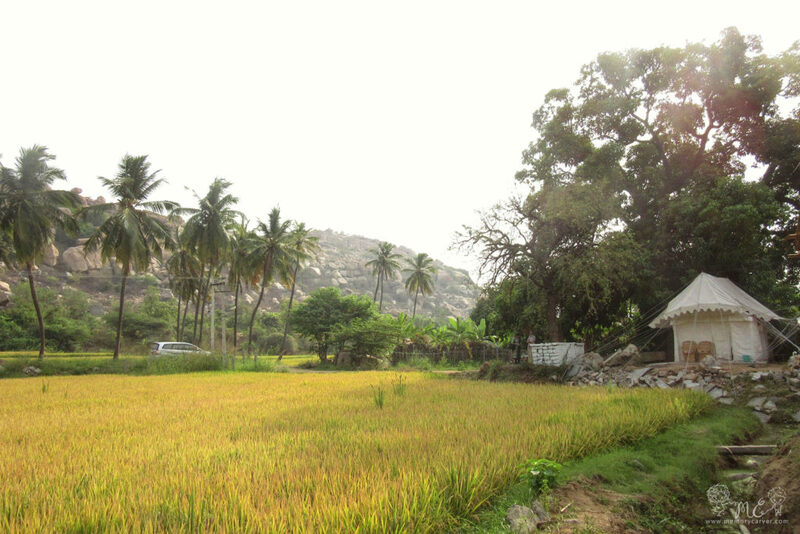 Amidst the paddy fields, enveloped by boulders, Tutti Hampi tents and café offers the perfect view to wake up to. PS: summer months do get mosquitoes as visitors! A perfect disjune before starting out to hunt down temples and ruins! You would need to spend at least 2-3 days to get the best of this place. If you are an architecture/history buff spending a few more days would be advisable. We have outlined a three day Hampi road trip itinerary, one flexible for all ages! Start early from Bangalore, maybe by 6:00 – 6:30 am. As I always say, break of dawn is the best time to avoid Bangalore traffic. We chose to travel via Challakere, a route known to house endless fields of sunflowers (unfortunately our timing was bad). Having booked a four-sharing tent stay at Tutti Hampi tents and café, we decided to drive past the Tungabhadra dam, longer but worthwhile route! 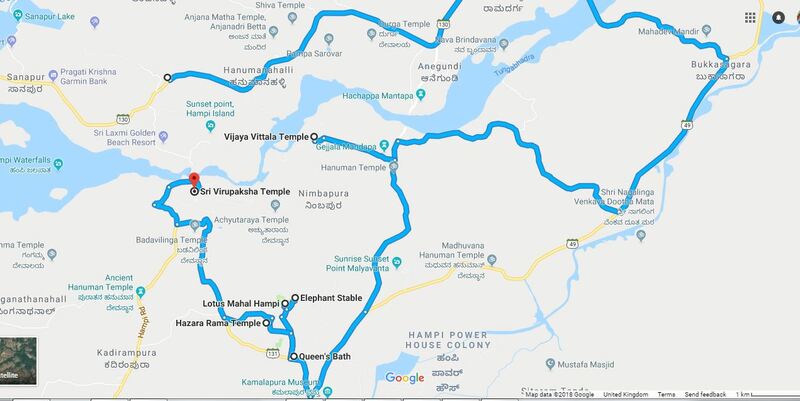 The roads leading from Challakere to Hippie island via Tungabhadra dam is kind of remote (as of 2018). Hence, I’d suggest you make a stop at some restaurant near Tumakuru, Kamat Upachar, Siri is recommended. If you are planning to take the Chitradurga route make a pit stop at Chitradurga fort. Reconcile at the Sanapura Lake, a quick stop en-route hippie island. Once you’ve reached your stay and still have some oomph left, go paseo along the paddy fields. 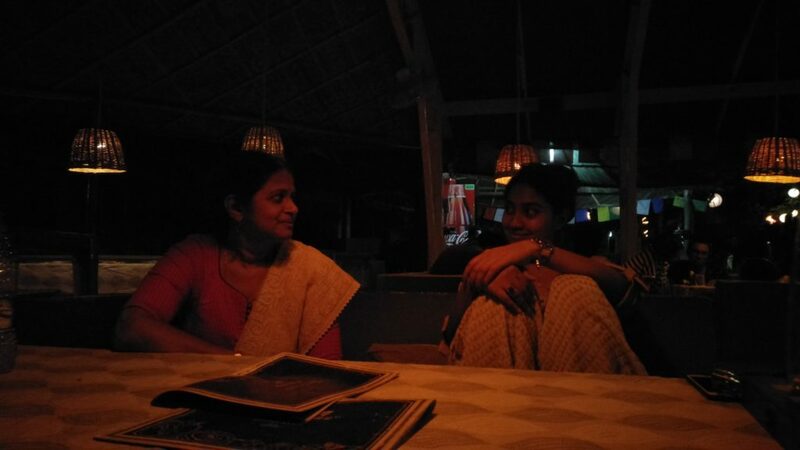 Having taken the longer route and some detours, we managed to reach Hampi by tea time. We headed straight to sunset point Hampi after having a ‘sort of’ high tea at Benjamin’s music café. Picking up small confabulations with these kids selling coffee at sunset point Hampi – A peaceful spot to enjoy the sun’s lullaby along with other fellow travelers. PS: DO NOT bother ordering thali meals, roti, rice, or anything similar once in a shack. You can always opt to kick start your day watching the sunrise at either one of these hills – Hemakuta, Matanga, or Anjandhari. We, however, being lazy-heads decided to push it to the last day of our agenda. Once you are done filling your breadbasket, arrange for an auto ride. Either rent one or pick up a guided auto tour as we did. Thankfully, our host at Tutti Hampi tents and cafe arranged an auto, or as they call it a ‘Tuk-Tuk’, ride. You can also coracle across (if you are staying at Hippie island) and rent a bicycle/bike. Beware of the scorching heat though! Route we took to cover main attractions in one day. Try to start off as early as possible, not just to beat the heat, but also to avoid crowd. We had our first stop at Vijaya Vittala Temple, most popular among tourists for its stone Chariot and musical (SAREGAMA) pillars. This was followed by the visit to Queen’s bath, Elephants stable, Lotus Mahal, and so on. That’s my dad narrating some history on Hampi he picked up on the road. Refresh yourself with “Naarial Paani”, you’ll find vendors selling Coconut water, soda lime, or fresh juice in front of almost every site. 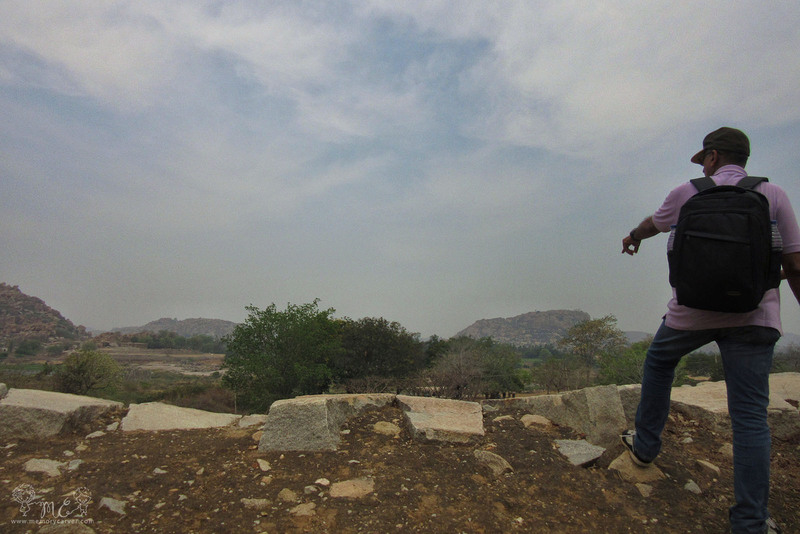 Enjoying the view on our way back towards Anegundi from Hampi. Spend the evening lounging along the bounders/fields near your stay, enjoying your evening tea amidst the greens. Ease into the day watching the sun loom over the boulders. Suggested place for watching sunrise would be Anjandhari – the monkey hill, Anegundi. It is comparatively an easier climb for all ages. Unfortunately, we had to skip the sunrise plan before heading back to Bangalore. 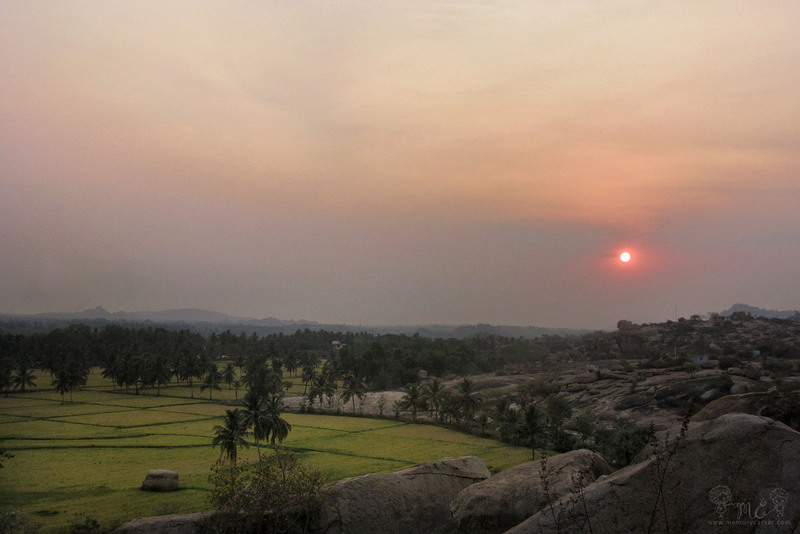 But I’am super glad I got to witness this mesmeric sunset at Sunset point Hampi. Head back to Bangalore choosing any one of the above mentioned routes. If you have an extra day or two to spare, combine this trip with a road trip to Badami, Aihole, and Pattadakal. Whatever the weather you choose to visit, it is always advisable to ‘summerize’ your clothes. Carry cotton clothes, preferably something loose. Also, don’t forget to dump in loads of sunscreen, caps/umbrella, water, and of course the road trip must – a sack full of snacks. 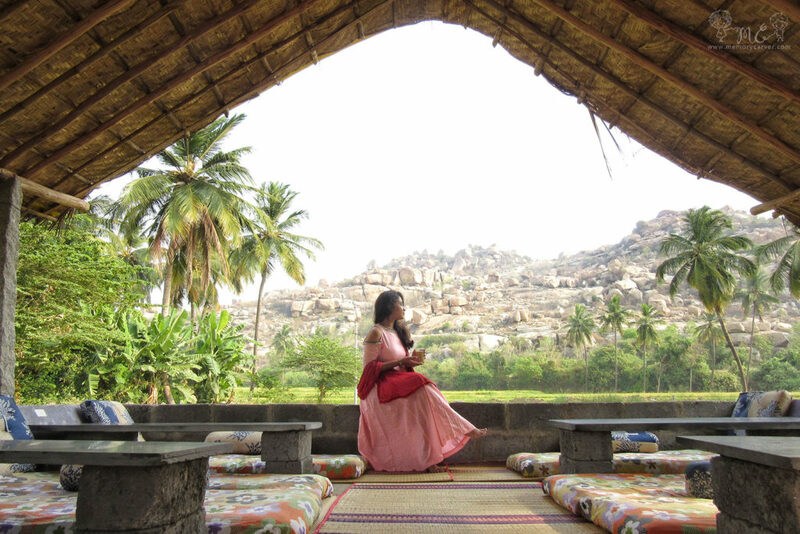 Stopover at places like Hampi is mandatory for our generation to realize how much globalization and “invisible communities” have snatched away from us! Just awesome…. am really speechless. After reading this I felt like I’ve completed a trip with you..well structured and detailed so as to guide anyone planning to go there. 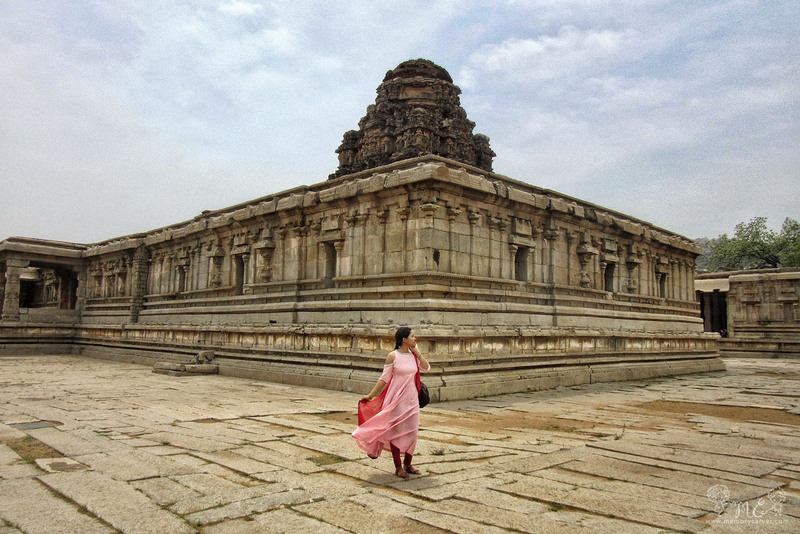 Your travel guide is pretty good for any enthu traveler to take note and follow..
India is a bundle of great Heritage.. Hampi is one such wonderful place, filled with astounding architecture.. one wonders, why these must turn to ruins!!! Greed to rule, I see nothing else. Humans will remain so….. what a creation!!! Best ever Tavelogue bit..leaving no stone unturned..! (Over time you could print/license your bits to other mediums !) One would seriously wish you could do more justice to the sights n sounds that the SubCon exudes every corner ! I mean more roadmiles ! Excellent work ethics n sefless engagement as always !